Handsworth Young People’s Parliament is an initiative for children from 28 local schools. The Parliament encourages young people to become active citizens within their local communities by enabling their opinions on important issues to be heard. We believe initiatives such as this are a key part in engaging young people, encouraging their development and giving them a way to feel that they can engage and be involved in the political world. Our 2018 - 2019 representatives are: Harpreet and Husnain from year 5, Renita and Zak from year 6. 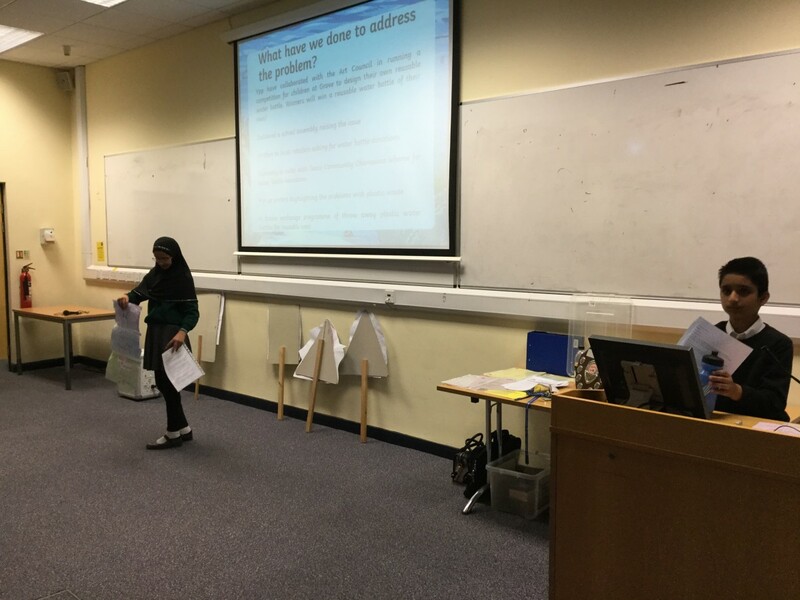 On Friday 22nd March 2019, Renita, Zak, Harpreet and Husnain represented Grove School at a YPP meeting in Birmingham City University. In the morning, we learnt all about how parliament works and how laws are formed. We worked with children from other schools to propose bills which could help the government tackle homelessness. In the afternoon, we had the exciting opportunity to present our ideas to MP Khalid Mahmood and ask him questions about his work. Mr Mahmood gave us a fascinating insight into British politics! On Tuesday 17th July 2018, the YPP delegates of Grove School attended the Dennis Edward's Awards ceremony at Birmingham City University. The Grove School YPP delegates were awarded the bronze award for their project called 'Let's Be Drastic, Use Less Plastic!'. The children worked extremely hard on this project to try and reduce the amount of throw away plastic being used at Grove School. Grove School is extremely proud of the children's dedication and focus at raising the awareness of waste management across the school. This is an ongoing project with the aim of all children at Grove using a reusable water bottle in the future. It was a wonderful occasion where the children's hard work was recognised and they were able to reflect on all the positive ways they have helped the school and the wider community this year. Grove School was also awarded the Young Leaders Award for taking part in the YPP programme. On behalf of Grove School, we thank the delegates for all their hard work this year and wish them best of luck in their next endeavours. YPP has sadly come to an end this year but Grove School is excited to welcome the new cohort in the next academic year. On Tuesday 22nd May 2018, the YPP delegates of Grove School attended the Dennis Edwards' Awards at Birmingham City University. Confidently, they presented their project 'Let's Be Drastic, Use Less Plastic' whereby they highlighted the dangers posed by plastic pollution in our community and their solutions to address these. The children used their speaking and listening skills to engage their audience and managed to deliver an important message with clarity and professionalism. Going forward, the children will be delivering the presentation to the children of Upper School, encouraging them to reduce the amount of throw away plastic they use and to increase the use of reusable water bottles. There will also be a competition running throughout the school where the children can design their own water bottle. Winners will be chosen by the YPP children and the Art's Council and prizes allocated to children who come up with the best designs. The YPP children are aiming for as many children as possible to be using a reusable water bottle at Grove School so that together, we can tackle pollution and encourage children to be drinking water at school in a sustainable way. Tuba and Siraaj presenting 'Let's Be Drastic, Use Less Plastic' at the Dennis Edwards' Awards. On Tuesday 6th February 2018, the YPP delegates of Grove School attended Birmingham City University for the YPP meeting themed 'Be the change you want to see'. The children put forward Birmingham Children's Hospital as their charity of choice for YPP to support this year. Each school argued their choices and then they collectively took part in a vote with their first and second choices. 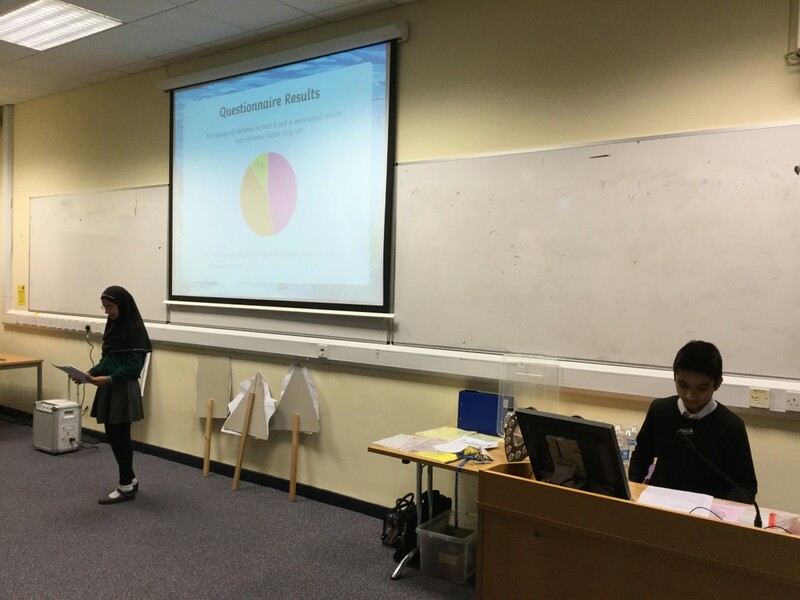 The votes will be counted and the Handsworth Association will let the children know the results of the vote shortly. The children also learnt about The Suffragettes and the fact that the 6th February was significant because it's the 100 year anniversary of women getting the right to vote. They then summarised this key event as a newspaper article to be presented to the children of Grove in assembly. The delegates were also set a number of challenges to help others and have decided to try and challenge the children of Grove with these so that they too can make a difference in other people's lives.